The installation of a Workstation Bridge Crane will deliver a reliable solution to address your material handling needs. We will help you achieve a new level of flexibility when approaching a number of applications within your workspace. These systems are designed to assist the individual worker to move easily while positioning the load that is being transported from one area to another. The workstation system reduces operator fatique and allows the worker to perform safely and efficiently. 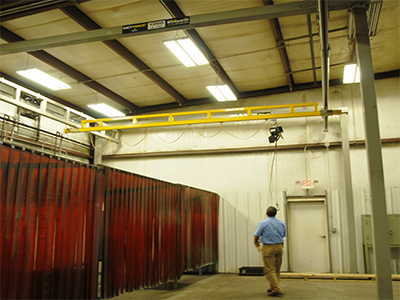 Workstation crane systems can be designed to be floor mounted to make relocation a viable option, or as a ceiling mounted solution where the facility has limited space. Whatever the specific need, Bridge Crane Specialists are here to address your challenges and solve the problems in your facility. Contact Us Today to discuss your needs and we will find a solution.